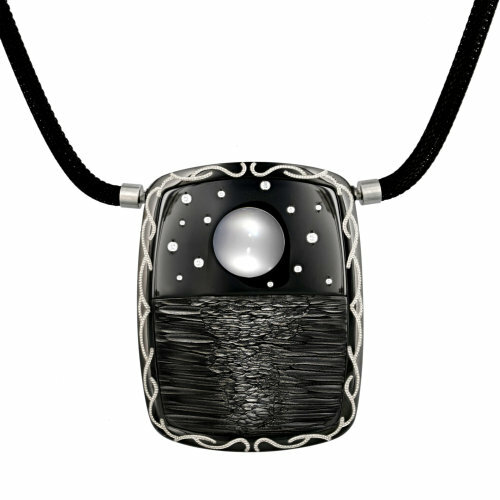 “Moonshine” – 1st Place Saul Bell Award winning necklace – 7.95 ct. shimmering Moon, reflecting on the water, surrounded by 14 Diamond stars. “Moonshine” – 7.95 ct. shimmering Moon, reflecting on the water and surrounded by 14 Diamond stars. Made in Knightsteel with a shaped pure Platinum border. 16″ blackened stainless steel woven chain. Knightsteel is unique in that it is the only scratch resistant and non-eroding black metal.